Yesterday the weather was in the 40s and it had me craving spring. It’s funny how 40 degrees can feel SO warm when you’ve been living in 20 degree weather for the past few months! I am so ready for sunshine and warm weather! Shopping has been tricky lately as I’m drawn to all of the pretty spring pieces popping up in the new arrivals section, but know I won’t be able to wear them (at least without 10 extra layers) for a few more months. I’ve been trying to put pieces in my cart that I know I can wear now and transition into warmer weather. 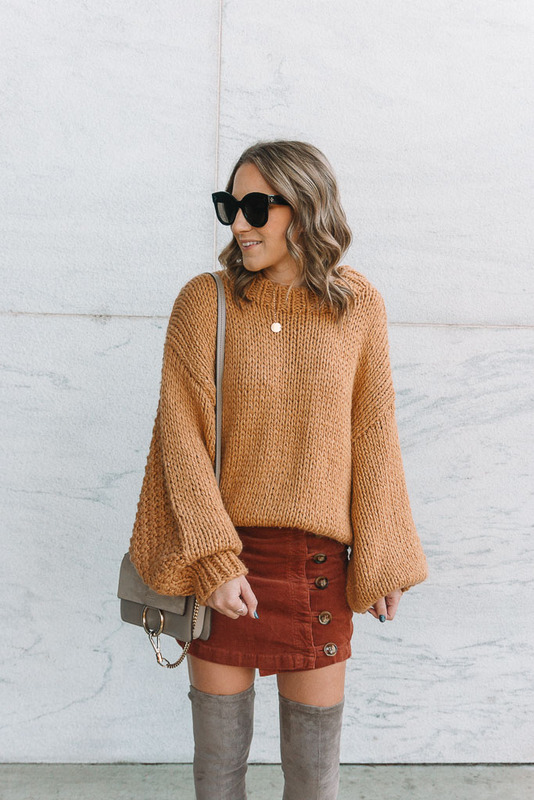 The moment I saw this pretty off the shoulder sweater I knew I could take it into spring with me! The color is the perfect neutral shade! 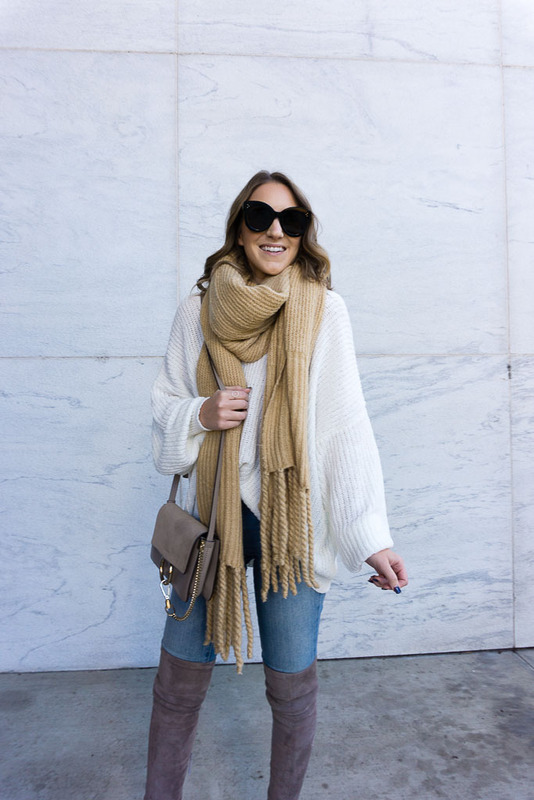 Cream goes with everything and I love that I can wear it with darker colors now and pastels in the spring! I’ve styled it with faux leather leggings and denim (see below) and plan on pairing it with a skirt soon! I love a good versatile piece! Especially when it’s on sale…snag this cutie for under $40! This is my first post of 2018! I’ve taken a little time off this winter break, and have enjoyed a little R&R with my hubby and pup! My winter break has officially come to an end though and school is back in session January 3rd. I am definitely going to miss lazy mornings and my comfy clothes, but it will be nice to get back to a routine! I am excited for the new year and all of the new content I am planning to bring to the blog! Look for a post on the most popular items on Twenties Girl Style in 2017 later this week! It has been SO cold here. I’ve been living in my coziest pieces and bundling up whenever I leave the house. I am looking for all of the ways to stay warm but still look cute! One of my favorite combos? 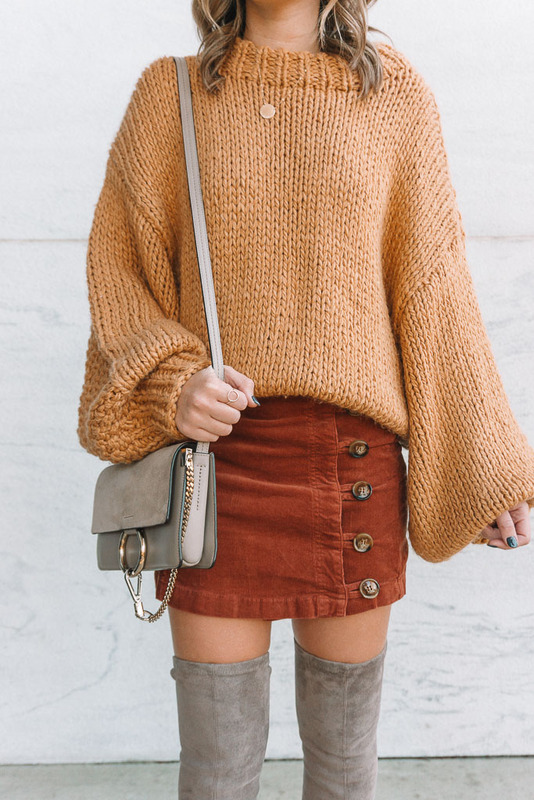 A chunky, oversized sweater, a skirt and over the knee boots. Over the knee boots are one of my favorite ways to stay warm and toasty without losing the style factor. These boots are currently on sale and I have been wearing them non-stop! They come in a few different colors, but this color is so easy to style! It’s not too early to start thinking Valentine’s day, and this outfit is already on my list of contenders for a Valentine’s day date with E!